It’s not difficult to give directions on how to make your vehicle look good, yet there are a few factors that become an integral factor to consider before getting the car polished at a car workshop. Car polishing process is a broad technique to either expel or veil sub-surface paint spots and incredibly upgrade surface shine in preparation for wax protection. 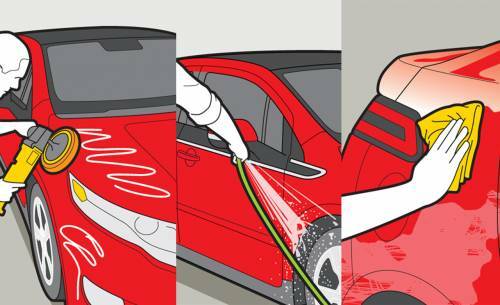 In this step by step guide, get answers concerning what car polishing process does and why it is the key to accomplishing an astounding finish. First, you have to wash your vehicle to be free of any dirt, grime, or different contaminants that may act as a barrier while performing the major polishing process. Buffing removes a definite layer of paint, uncover the fresh paint underneath, and the compound works as a paint stripper. Spread the compound uniformly over the surface using the buffing pad. Avoid putting the compound on rubber, chrome, or glass. Turn on the buffer and work the region in the circular motion, holding the pad totally flat consistently. The surface must seem new after buffing. Now, you can start polishing out deformities and spots. The genuine car polishing process includes complete redressing of even very harsh sub-surface paint damages with machine polishing at Pitcrew. It similarly becomes easy to deplete your clearcoat excessively in a short period of time. Apply polisher in small car areas at once, centering where damage and marks seem most. Wipe off while still wet within a minute. To complete, apply polish over the remaining car area in small portions. Work it off smoothly applying less pressure. When polishing is done, protect it with a wax protection. Use a microfiber cloth to remove the wax, applying circular motions to give a new and glossy look. This entry was posted in Blog and tagged car polishing process. Bookmark the permalink. ← Why Does Your Car Needs a Tyre Alignment?